Learn all about the next state in Europe (or in the Milky Way, we don´t care as long as it’s a state). Per regalar aquest Sant Jordi als seus amics de parla anglesa! We Catalans are a nation. It is true that we’ve always been happy to be counted among the Spanish peoples since the creation of the Roman province of Hispania; fortunately though, at the end of the 19th century a bunch of intellectuals started to uncover a massive historical plot to crush the Catalan people. And we realized that we had always been a nation. And not just any kind of nation but a truly ancient one. Because, you know, in the 9th century Charlemagne created a strip of land in the north of the Iberian peninsula to protect the rest of Europe against the Moorish invasion. That was us! Not the Moors (we have always been staunch Catholics like the rest of Spain) but the land. It was called the Hispanic Mark. But never mind, the term “Catalan” appeared a mere 300 years later. It is true that the Mark comprised parts of other Hispanic kingdoms such as Aragon and Navarre, and that most of current Catalonia was not part of it, but you get the idea. Yes, we also participated in the Reconquista to take our land back from the African invaders. Little by little, the Catalan counties grouped around the County of Barcelona, and then they joined the Kingdom of Aragon and together under one king we reconquered Valencia and the Balearic Islands. And what a great independent nation we were then, ruling the Mediterranean waves with our four striped flag! Well, you won’t find the term “Catalan nation” in the historical documents because we were known as the “Kingdom of Aragon”, but again you get the idea. Some years later our Kingdom joined the Kingdom of Castile, not because of battles or defeats (we only ever really fought against the Moors) but because our King Ferdinand of Aragon married the Castilian Queen Isabel. I am sure the Catalan people then must have strongly opposed such a marriage and there must have been an uproar and lots of revolts when they learned about it, but there is no evidence for that. In fact, the history books only reflect celebrations and joy at the regained unity of Spain after 800 centuries. You can smell the plot I told you about earlier. When America was discovered, the Castilian Crown tried to prevent us Catalans from playing any part in the conquest and evangelization of the New World. It is true that the first mass in the Americas was said by a Catalan monk from Montserrat, and that the first military commander in America was a Catalan, but that was probably just a coincidence. Thank God, some extremely reliable historians have recently discovered that Columbus was not from Genoa but was a real Catalan, as wer his son (sic) Erasmus of Rotterdam and the author of Don Quixote, Miguel de Cervantes. You see, the plot against us again. In 1714, when the Spanish king died without a successor, we Catalans supported the Austrian candidate while the perfidious Castilians backed the French one. Well, it’s true that at first we swore our allegiance to the French candidate but for whatever reason we changed our minds some years later. So we fought a war against the rest of Spain…mmmm … though Valencia, Aragon and part of Castile also fought against the French guy … and a lot of Catalan regions supported the French candidate. What a mess! But you get the idea. The fact is that our candidate lost and the Bourbon was crowned king. After that we lost our freedoms because all the rulings of the local Court were to be written in Spanish. No, they were not previously written in Catalan but in Latin, but again, you get the idea. It is true that our country thrived for a century after the defeat, but that was only thanks to the industrious Catalan spirit. When Napoleon invaded us in the early 19th century we revolted against him, as did the rest of Spain. To be honest, I am a little puzzled here as the Catalans then spontaneously fought under the Spanish flag and engaged the enemy crying “For King and Spain!” They must have been brainwashed, don’t you think? By now it should be clear beyond any reasonable doubt that we Catalans are a nation. We have a unique flag (the four striped one, which is almost the same as the flag of Aragon, and the Valencian one, and the Balearic Islands flag). We have our own unique language (well, 60% of Catalans have Spanish as their mother tongu), and we were fully independent once (mmmm …I am sure that after reading all this you can say exactly when that happened). 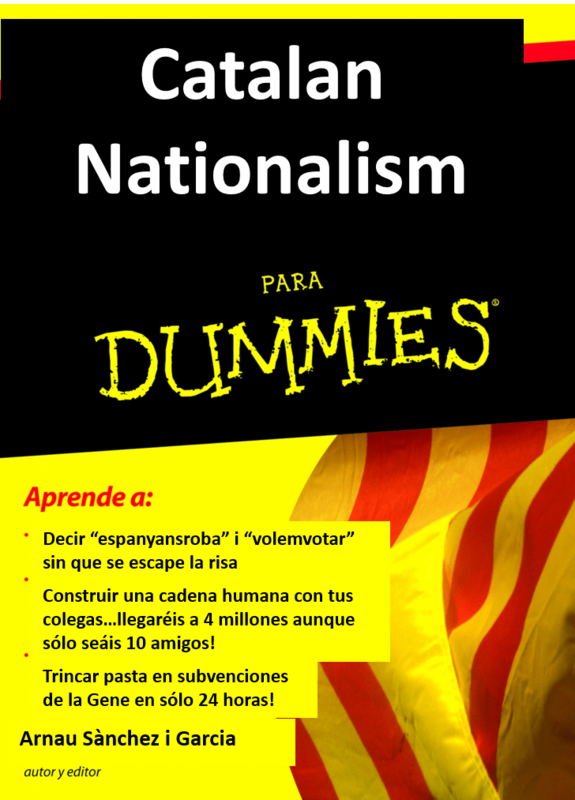 In my next book Catalan Nationalism for Chonis I will explain to you how Spain has tried to crush our (imagi)nation during the 20th century. ‹ Lo que queda de les mones de Pasqua. jajjajajajajaja pero qué CRAK !!!!!! Me muero de risa. Genial!!!! Congratulations and all the best! We are catalonians and Spanish! Hahaha … I love this site! Please, don’t stop teaching us how nazionalism is invading your lives, your souls and is killing slowly your families and society … And don’t forget that Hitler (Mas) is dramatically crazy.